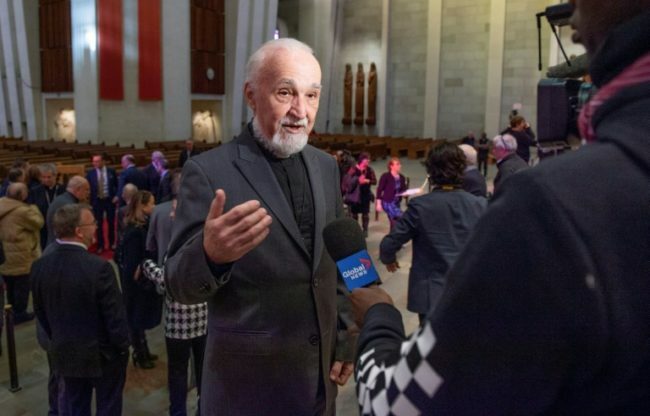 A catholic priest was stabbed in front of his horrified congregation live on television during morning mass on Friday at Canada’s biggest church in Montreal. Footage broadcast on a Catholic television station and picked up by the top-rated CTV network showed a man in jeans, parka and white baseball cap approach Claude Grou at St Joseph’s Oratory, in the full glare of 60 horrified parishioners. Saint Joseph’s Oratory, built from 1920 to 1955, sits atop the north face of Mount Royal overlooking Canada’s second-largest metropolis, and attracts some two million pilgrims and tourists each year. In 2017, a shooter gunned down six worshippers at a mosque in Quebec City.